The Be a Tree program is a dog bite prevention seminar program for school-age children. This program focuses on fun and interactive activities to teach children how to read dog body language and how to act safely around both their own dog and strange dogs. 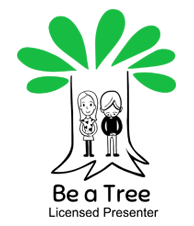 The Be a Tree program is supported by a teacher kit that presenters use to ensure a consistent and accurate presentation. The program and the kit have been developed and reviewed by experts and are designed for use by classroom teachers and presenters. 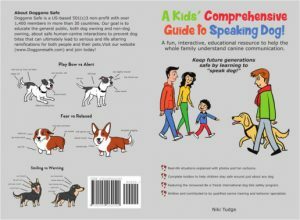 The Be a Tree program is featured in this new book by Niki Tudge called A Kids Comprehensive Guide to Speaking Dog. A much welcomed resource for families to use. Schedule a consultation with your local DogSmith who can deliver this presentation to your family, your school or other group. Teach your kids to "Speak Dog"
Half of all children bitten by dogs are under the age of 12. Most dog bites are by the family dog or dogs known to the person. Most dog bites are preventable. A dog bite can happen very quickly. There are numerous reasons why dogs bite. For example, the dog may be unsure of the situation, want space, feel scared or threatened, be protecting his food or toys, be feeling ill or be in pain. Safety is paramount for both children and dogs and by following a few tips you can reduce the likelihood of these unfortunate incidents. Most importantly, never put children and dogs in a situation where their safety is in question. Learn to "Speak Dog"